New week…new ideas…here’s one…Select a spot in your instructional space to designate as an attention-getting Idea Garden. Make a sign for your Idea Garden. Keep reading for Steps to Follow. What grows in an Idea Garden? Creative Thinking Skills, Appreciation for the Scientific Process, Brain Power. How? An Idea Garden’s “bounty” is an inviting collection of age-appropriate challenge cards that “knock on the mind’s door.” Students who stop by your Idea Garden when you schedule time for visits get to pick something that “grows” there. They use creative thinking skills, scientific processes and brain power to work/play with the challenges. CHALLENGE: “Plant” Sunflowers – What can you “plant” in your Idea Garden? 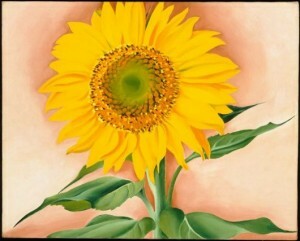 How about copies of the American artist, Georgia O’Keefe’s famous sunflower. Write ideas on the sunflowers for kids to think about and act on that relate to these bright yellow beauties. 2) Write questions about sunflowers on them (one per circle) Example: Q: What can people eat from sunflowers? A: the seeds, oil made from the flower. 3) Glue or tape the circles to the sunflower centers. 4) Optional: glue thin pieces of cardboard folded in L-shapes to attach to the backs of the sunflowers so that they can “stand” up in the Idea Garden. Set the sunflowers on brown and green colored paper. CHALLENGE: Leave a Basket Full of Gathered Crops – In some parts of the world, spending time gathering crops isn’t child’s “play;” it’s a requirement of children whose families farm for a living. Make this fact a part of your Idea Garden. 1) Copy and cut out illustrations or photos of different crops. Some of the photos may show children working in agricultural fields. 2) Write questions about the crops on the backs of the copies. Where in the world do they grow? What do they taste like, etc. 3) Set the “crops” in a basket on a table in your Idea Garden for students to explore. NOTE: Students in grades 3 – 5 can research answers to questions on their own. If you teach kids in grades K – 2, you can “visit” the Idea Garden as a class activity. Allow children to take turns picking a crop from the basket. Play Show & Tell. Hold up a crop, discuss it with the class, encouraging student participation. What else can you “plant” in your Idea Garden? yummy – especially when they get to eat them after the picking! CHALLENGE: Draw and Color from the Garden – Add an artistic element to your Idea Garden and encourage students to create their own art in the process. Popular fruits and vegetables have been the subjects of original art, including photographs and paintings, for centuries. 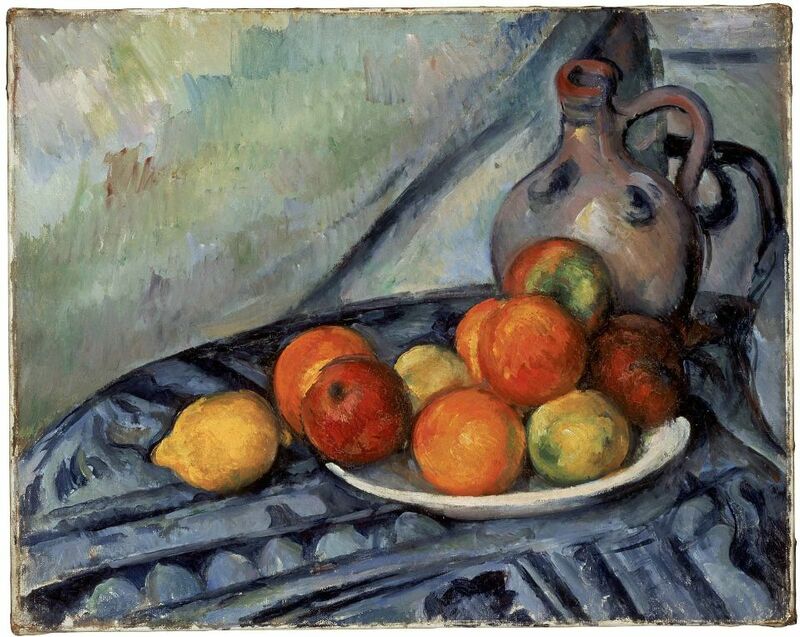 1) Select prints of famous art work, such as Paul Cezanne’s fruits on a summer table, to display on an easel in your Idea Garden. Copies of art may be downloaded free from online sources, including world-famous museum sites. Look for works that feature garden fare. 2) Leave blank pieces of white paper in a bucket with pencils, crayons and markers on your Idea Garden table. 3) Tell students that they can borrow an art print and use it to guide them as they create their own garden drawings. 4) Optional: Run a clothesline above your Idea Garden, tacking the ends to adjacent walls, and clip clothespins to the line. When students finish garden art, they can hang their work on the clothesline. 5) Garden art that features incredible edibles – nutritious fruits, vegetables and flowers, like sunflowers, can serve as colorful prompts for discussions about healthy living. “Plant” opportunities for recycling and reusing newspapers in your Idea Garden. CHALLENGE: Cultivate Clever Ways to Reuse Newspapers – Newspapers may no longer be the primary news source for many teachers, students and their families. But newspaper recycling is still big business. Add a scientific challenge to your Idea Garden…invite kids to come up with cool ways to recycle or reuse old newspapers. I got this idea from reading about a middle school student in a North Carolina community who made a dress out of newspapers for an Earth Day project. She used an old dress as the undergarment of her design, and attached pieces of newspaper folded in fans to the front of the dress. Decorative? Yes, and definitely creative! This student has a future in forming fashions out of unusual materials, if she wants to pursue that career. Upper elementary students can jump on the newspaper recycling/reusing bandwagon, too. 1) Start saving old newspapers yourself, and with others’ help. 2) Collect the newspapers in a large box on the table in your Idea Garden. 3) Make the box do “double duty.” Use one side of it to post your Idea Garden sign. Write OUR CLASS IDEA GARDEN in large print on a large sheet of colored construction paper. Tape the sign to the most prominent side of the newspaper box. 4) Tape a smaller sign to another side of the newspaper box with the challenge: What can you make by reusing newspaper? 5) Offer age-appropriate “starter ideas” for the class. 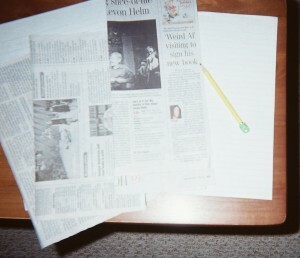 For example, kids can fold newspaper into paper hats or paper airplanes. 6) Leave sheets of notebook paper and pencils near your newspaper box so that kids can plan their projects before making recycled works. 6 Pings/Trackbacks for "Cultivate Creative Thinking with an Idea Garden"